Running a tad late, but will be there. Meeting tomorrow. 7pm as is tradition. As a heads up, I am traveling out of town, and be unable to attend. I’m going to be busy at work tonight. I will not be there. I’m certainly interested. I’ve been talking to @wandrson about a project around an operating system for high-altitude balloons. Such an operating system would take care of the low level real time functions such as telemetry marshaling, experiment control, mode control, and digital RF communications. I’m thinking it would be based in part on the Fox-1 line of satellites by AMSAT. But, we want to be careful and avoid any ITAR or EAR issues arms “deemed” export issues. There’s also some interest around a tracking ground station. @wandrson and I have have built alt-az rotators based heavily on the SatNOGS project. I also have a bit of software written by Andrew Koenig at UTD that will track a ballon based on its transmitted GPS coordinates and altitude. Might be a good build project, too. @zmetzing has expressed interest in such technologies, so I’ll loop him in, too. Yup, and I actually have a picodopp kit somewhere, back when I used to chase these things in HS. Interesting thing about a canned oscillator at 11.2896MHz – the 13th harmonic is exactly in the 2m bands, and, if you apply a little filtering and a properly-sized antenna, you get a nice beacon. Add a small PIC (or Atmel, whatever) and fiddle with the voltage on the VDD pin of this oscillator and you’ll FM the tone, which is multiplied up by that same 13 … presto, tone ID and telemetry! I don’t want to burst y’all’s bubble, but I have no clue why we’d need a custom RTOS for this. Or a custom transmitter. We’ve been designing around a Pixhawk, an APRS board from another makerspace, and (iirc) a transmitter module made for drones for a while now. Although there’s been recent discussion about switching to a Chinese Ardupilot knockoff. No bubbles burst. It’s no surprise that a balloon can be launched then tracked/recovered with only simple electronics. My interest is more in using the high altitude balloon as a test platform for missions requiring greater capability. When the time came for Shawn Wright of Calgary, Alberta to solidify his marriage proposal to his fiancée, doing it on Earth simply wasn't enough. 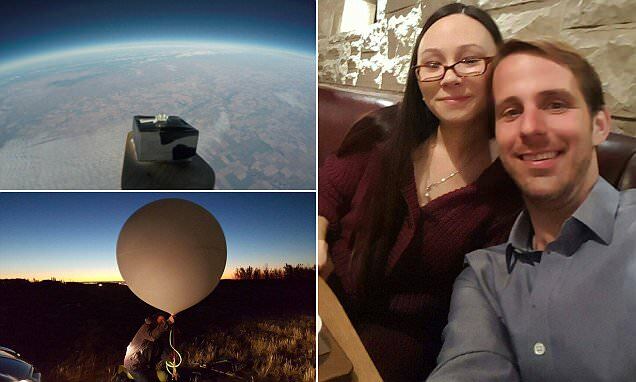 So, he sent the ring up to the stratosphere on a balloon. Meeting tomorrow at 7pm. I plan to be there. General tasks are as previously listed. I’ll be a little late. On the way now. I won’t be able to attend tonight. Sorry, I missed it. Had a conflict. Can you summarize the results? We got two prototypes built for the release mechanism. I ordered an APM that we will be using for telemetry and eventually automated return, but unfortunately it hasn’t arrived yet. We do have another APM on the RC desk though, and I started work on getting it to do hardware-in-the-loop simulation with xplane. The idea is that we can simulate the drop in xplane, and the APM should be able to navigate back to the LZ automatically. Harold described the meeting well. It was just the two of us. One thing we need to do is get Nick to leave the APRS board at the space at some point. Alright, meet tonight at 7pm as per usual. I did speak to Nick last night, and he said he’d bring the APRS board. So last night Harold and I worked on the Ardupilot knockoff mostly. Discovered pin 9 can be used as a “relay”, and there’s a way to script this in the mission planner. What is our other telemetry system, again? Once we have the electronics worked out and the attachment system ready, we can do some flight testing on a drone, then move on to the real deal, I believe. I’ll bring the APRS board up later this week. Yes, I am a ham radio operator, license KD5FTN. The APRS Transmitter is designed to be a stand-alone redundant location tracking mechanism, totally independant of the APM autopilot. We’ll likely also want to add a small RC receiver to the payload which we can use to both manually fly the glider and/or manually activate the nichrome trigger, if we have an RC signal. Switch activated on RC transmitter (Dependent on RC signal being received). The good thing is, bot the telemetry and RC radios will have RSSI telemetry to let us know signal strength, but we won’t know real-world range until we actually go fly this thing. I was looking at the APRS board and noted it has its own GPS on it. Would it be feasible to get the GPS on the APRS board to interface with the Ardupilot GPS input, so that we don’t need to chase down a new GPS module? Not unless the APRS has a GPS/Compass I2C output.